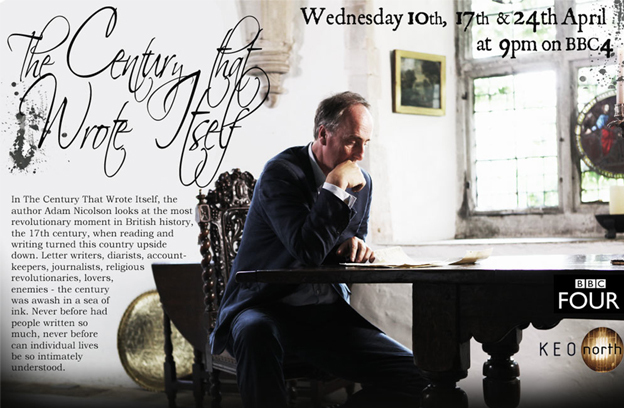 Leigh Penman, our former Samuel Hartlib Postdoctoral Fellow, was recently in action on the prestigious BBC Four documentary The Century That Wrote Itself. Presented and written by author Adam Nicolson, the show explored a wide variety of seventeenth-century scribal and reading practices by means of a series of beautifully shot and edited case studies. One of these was Samuel Hartlib, and Leigh headed to a café on the concourse of St Pancras International to be interviewed by Adam about the intelligencer’s epistolary contributions. The programme is still available on the iPlayer; the Hartlibian section starts at 37:30. Project Director Howard Hotson also advised, while Leigh talks about the size and descent of Hartlib’s archive in this podcast. This entry was posted in Documentaries, Podcasts & Videos, Project Updates on April 26, 2013 by James Brown.